Who's Afraid of Peak Oil? 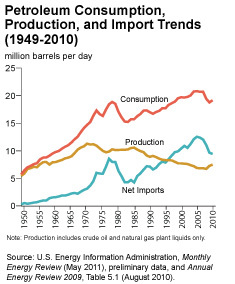 Today, the United States is experiencing a veritable boom in its oil and gas production. And make no mistake; it's attracting billions of investment dollars from all around the globe. So is the outlook as the rosy as it appears, or are these projections creating a future energy scenario that's too good to be true? Well, you've read the same headlines we have — and certainly the same projections boasting an energy-independent America is just over the horizon. So the answer is both yes and no. The real show started more than 150 years ago outside of Titusville, Pennsylvania, when the Pennsylvania Rock Oil Company of Connecticut contracted Edwin Drake to find oil. The first commercial well was drilled at a depth of 69 feet. Since then, things have been good for the U.S. oil industry. For a brief time, Pennsylvania was the world's largest oil producer. 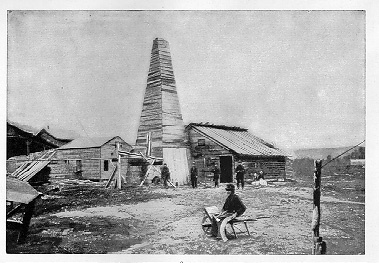 The success in Titusville spurred a rush of drilling activity, and by the turn of the 20th century, the United States was averaging 174,000 barrels per day. About thirty years later, our oil production was well over two million barrels per day — and rising fast. In fact, the United States was on top of the world's oil stage for much of the last century. One serious problem, however, was that we grew too accustomed to cheap, easy-to-extract oil. Back in the 1930s, the United States was producing 100 barrels of oil for every one barrel it had invested. What's worse, it took just one man to bring the good days to an end. Back in 1956, a Shell geoscientist by the name of Dr. Marion King Hubbert gave an ominous speech in which he announced U.S. oil production would peak in the early 1970s. Simply put, Peak Oil is the point at which oil production reaches its maximum rate, which is then followed by a decline phase — every single oil field on the planet goes through this cycle. Now, let's be clear here: We're not talking about how much oil is left in the world. The problem has never been that we're running out of oil; rather, Peak Oil refers to the slowing of the rate at which we can produce it. Think of it like this: If we could put every drop of oil in the world into one gigantic barrel, yet were only given a small cup to draw out the oil, we'd be in serious trouble. Sure, the oil is sitting right in front of us, but we would be unable to get it. 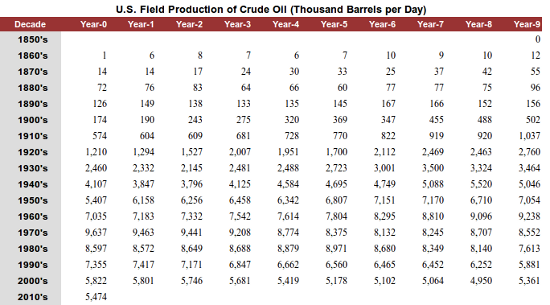 Hubbert's prediction came true in November 1970, when our production averaged 10.04 million barrels per day. Since then, our country's production has been steadily declining. To gain a better perspective of the situation, we'll look deeper into the nation's three largest oil-producing states: Texas, Alaska, and California. In 1981, Texas, Alaska, and California were responsible for over 60% of our domestic oil production. Approximately 5.1 million barrels a day were pumped from these three states. But by 2005, their share in U.S. production fell to about 50%. Five years later, they only contributed 42% to our total output. Of course, we've felt the consequences. And as you can see, in order to meet our domestic energy demand, our imports of crude oil and petroleum products have more than doubled since the peak. The truth is that we will never top our peak production of 10 million barrels per day. Even taking the government's optimistic projections, the unconventional boom taking place will only add about 2.2 million barrels of oil to our total. But here's the rub for investors like us: Our production doesn't have to top our 1970 peak level. Despite the dismal news concerning our domestic production during the last four decades, a small group of investors has caught wind of a good old-fashioned oil boom taking place on North American soil. Their success is coming from an unconventional source of oil that is primarily responsible for the recent increase in U.S. oil production. When it comes to energy and capital, Energy & Capital is early and right. We've gotten our readers ahead of the curve and the herd time and time again. Energy and Capital editor Keith Kohl finds five high-yielding stocks that investors can use to limit their risk exposure in a sea of market volatility. Keith Kohl explains why the latest USGS report on Alaska shale resources may be the state's last chance to save production. You know a bull market is really running when the scams start showing up... Today, with oil and gas boomtowns being born from Billings to Baton Rouge, everyone is trying to cash in on the craze.